Linda Loeschen grew up in New Jersey and was trained at Parsons School of Design in New York City. She pursued a short career in interior design before deciding to move west for skiing and an outdoor lifestyle. 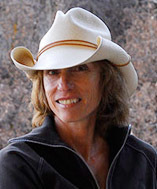 It was here that she met her husband, who breeds American Quarter Horses on a small ranch outside of Aspen, Colorado. Now they're considered longtime locals. Using the watercolor skills she acquired at Parson's, Linda began drawing and painting the things that surround her - the ranching lifestyle gives her plenty of subject matter. The house is full of saddles, tack, denim jackets, cowboy boots and hats hanging from deer antler racks - much of the regalia that appears in her work. And of course, horses, cowboys, children and fabulous flowers and landscapes are everywhere. Her fresh approach to these subjects is very popular and she is represented in collections nationwide. Although much of her inspiration comes from right outside her front door, she also travels throughout the west to rodeos, roundups and other events photographing the western lifestyle and gathering new ideas for her paintings. Linda also gives lectures, demonstrations and workshops throughout the Rocky Mountain Region. Her paintings, prints and cards are offered in several galleries in Colorado, Arizona, and Vermont. Articles about her art have appeared in Art of the West, Southwest Art, Art Talk, Art Trends, Western Horsemen, and US Art. Linda Loeschen is also a signature member of the Western Academy of Women Artists (Arizona) and Women Artists of the West (California). She received her latest honor at the prestigious American Academy of Women Artists, Signature Show, at the Desert Caballeros Western Museum, Wickenburg, Arizona where her piece was awarded BEST WATERCOLOR and BEST of SHOW (1997). "Life is so short I wish I could paint faster to capture all those special moments like the splash of light on the snow, the lengthening shadows at the end of the day or the cocky tilt of a cowboy's hat. Every day there is something new, something fresh, something to paint."